Be the first to share your favorite memory, photo or story of Tom. This memorial page is dedicated for family, friends and future generations to celebrate the life of their loved one. 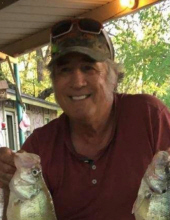 Tom Bryan, 66 year old resident of Afton, Oklahoma passed away March 12, 2019 at his home in Afton. Tom was born on January 2, 1953 in Sacramento, California to Charles and Clara (Perdue) Bryan. He married the love of his life, Jannetta Moore on August 16, 1981. Tom was well known for his game roosters and his training of racing pigeons and refereeing of game rooster fights. Tom was preceded in death by his parents, one son Devin Thomas, one grandson Shannon Thomas, and one sister Tina Bryan. Tom leaves behind his loving wife, Jannetta of 39 years, six children, Gary Bryan of California, Renee Robinette of Ohio, Norman Thomas of Pryor, Oklahoma, Jayme Thomas of Louisiana, Holly Luster of Ketchum, Oklahoma and Jason Thomas of Ketchum, Oklahoma. He had 12 grandchildren and 15 great grandchildren. Tom also leaves behind three siblings, Tim Bryan, David Bryan, and Mary Bryan all of California as well as, three sisters in law, Cheryl Baker, Linda Baker and Chris Hill, all of Ketchum, Oklahoma. The Celebration of Tom’s life is pending and will be held at a later date. Arrangements have been entrusted to Burckhalter Highsmith Funeral Services and Cremation in Vinita, Oklahoma. Online condolences may be made at www.highsmithfh.com or on our funeral home Facebook page. To send flowers or a remembrance gift to the family of Tom Bryan, please visit our Tribute Store. "Email Address" would like to share the life celebration of Tom Bryan. Click on the "link" to go to share a favorite memory or leave a condolence message for the family.